The new Sixth Form Centre for Claremont Senior School is under way. With just 6 months to carry out all the detailed design and hand it over for summer holiday fit-out, we will be busy. The pupils at Claremont Senior School are working their way through the years, having been the very first intake for this new school. Now they need a sixth form. 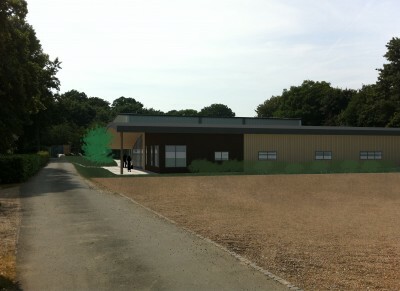 These will be custom-designed, modern and attractive premises for teaching, relaxation and, perhaps most of all, study. Starting from scratch we have worked with the school to choose the best position, then custom design the building to meet the specific requirements. Functionally, it will be a large and adaptable space with an area of 640m2, with very generous proportions and quality throughout. Ceilings are high and designed for good acoustics and general well-being. There are lots of teaching spaces of varying sizes and styles to suit the varied needs of a sixth form. The study area will be particularly attractive as this is such an important aspect at this stage of education. Aesthetically, the building is designed to be attractive and to fit well with the surroundings. It is of modern design yet in keeping with the sensitive area, close to Bodiam Castle. The result is a single storey building with very generous proportions that will look much smaller. Use is being made of curves and timber to soften the building into the surroundings. Internally there is use of natural daylight and ventilation for the benefit of the students and also as best practice for sustainability. For Directline structures this is the 20th project for education, either sport or academic. This is the fifth project from Claremont School, and the fourth to reach construction stage. We continue to strive to offer the best possible value for our clients while maintaining high quality and bespoke design. For more information, you can go to the School’s website. To see more of our Education projects visit the Education page. If you’re planning a construction project, why not fill in your details on our contact form and see what we can do for you.